The Shadow Throne Kickstarter wrapped up over a month ago and the team is hard at work finishing the game so we can send it to the printer. While we get the final files ready, I thought I’d take a little time to go over the Kickstarter to discuss what we did right and what we could improve for next time. I gave some quick impressions in my last post, but today I’ll start going over the campaign in a little more detail. There’s a lot to cover, so I imagine this will take three or four posts total. To break things up, I’ve decided to start by discussing the basics of the campaign itself: the appearance, the video, and the reward tiers. 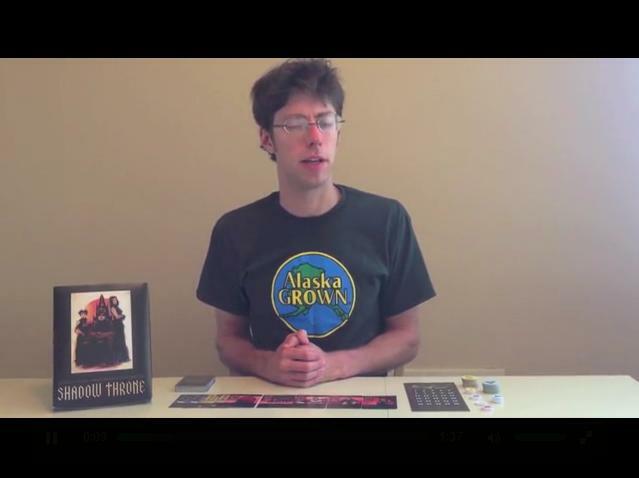 Moving forward, I’ll discuss the rest of the campaign, from the updates and stretch goals to the reviews and outreach. 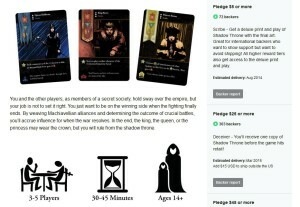 A little bit of the Shadow Throne Kickstarter. Isn’t it beautiful? – Jesse’s artwork is front and center. I have little doubt that many people pledged solely based on his dark, stylistic work. – You may not have noticed Slim’s graphic design work on the main page, but that’s perfect… good graphic design just feels natural. That said, I received many compliments about his game info graphic, pictured in the screenshot. – Benjamin’s story may only be in the top few paragraphs, but I’ve been delighted to see how quickly people grasp onto the idea that the war is not just between factions, it’s between the royal family. This grounds the whole game and makes people want to learn more. All in all, I give us a big thumbs up for presentation. Even filming the video put me to sleep. …I wish I could say the same for the video, but unfortunately I think it’s the weakest aspect of the whole Kickstarter. Don’t get me wrong… it’s passable. But making this simple video was more work and more stress than I expected, and it’s especially frustrating since I identified the Corporate America Kickstarter video as that campaign’s greatest weakness as well. Part of the problem was overcompensating. The Corporate America video was overly ambitious, unfocused, and barely coherent. It gave the impression that the project was being run by a bunch of amateurs in over their heads. I hope I’ve proven that’s not the case (I just make games, not videos), but I didn’t want to give the same impression this time. Unfortunately, I swung too far the other way. My plan was to record myself talking to the camera for two minutes or so. Short, simple, minimalist. Boring. And the low quality recording (from too far away with a simple iPhone) didn’t help. As I showed friends before launching, several were very alarmed by the video, even saying that I needed to delay the campaign. So days before launching, I frantically fixed up the video. I found some music. I got some video editing software to squeeze as much art into the video as possible. I cut out and rearranged quite a bit of me talking. In the end, the video was vastly improved, but that doesn’t mean it was good enough. I’m sure that the video discouraged some potential backers, and I don’t want this to happen in the future. There’s a balance to strike between being personal and quaint versus professional and sleek, but next time I want higher quality production with more focus on the game and less on me. Some simple animations would go a long way. I also plan on giving myself more time in case things don’t quite work out as planned. Another area I hoped to simplify from Corporate America was reward tiers. Over the course of that Kickstarter, I decided to experiment with lots of specialized, custom reward tiers, and things got a little out of control. Though it helped fund that project, I wanted to avoid it this time. So how did I do? Not bad! There were six reward tiers, and they were all chosen at least a handful of times. The $1 tier was just to watch the project. Having something like this is easy and I highly recommend it. The $5 tier was for a deluxe Print and Play of the game with final art. I gave away a PnP of an early version of the game for months before the Kickstarter, so I wasn’t planning on selling another PnP, but others recommended it. It was a really good move. With a total of 72 backers, there was a lot more support here than I expected. For one thing, this gave international backers the option of supporting the game without paying an arm and a leg for shipping. For another, the art for the game is excellent, so this let people access it without paying the full $25 for the game. Finally, just having a $5 reward tier is a good idea. The $25 tier was the base game. With 303 backers, I’m really happy with the results. Obviously, this tier is required for any board game Kickstarter. $25 seems to be a sweet spot. The $45 tier was two copies of the game. With 45 backers, it went over suspiciously well. The Eternal Manipulator reward tier: an unexpectedly good move! 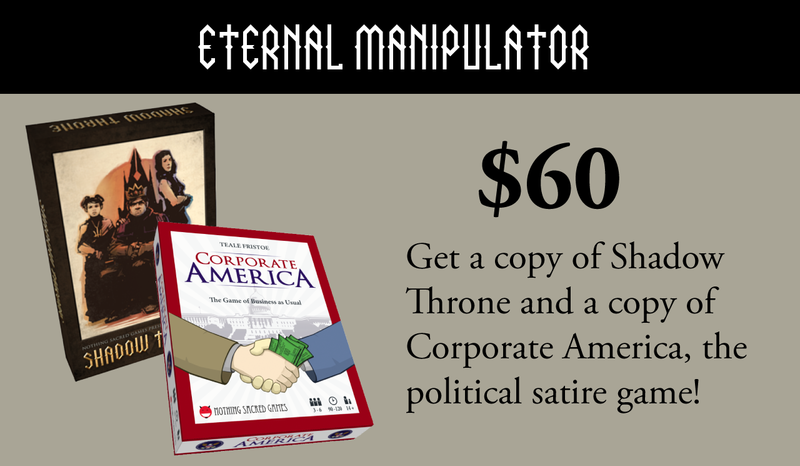 The $60 tier was a copy of Shadow Throne and a copy of Corporate America. I had no plans on this reward tier, but right before the campaign I met Richard Bliss of Funding the Dream, who highly recommended it. His advice was golden. 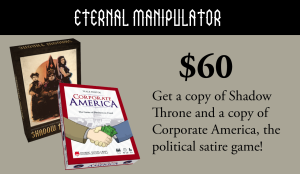 Not only did 57 backers get a great deal on two great games, I was able to move 57 copies of Corporate America, which is about twice what I sold otherwise in June. Definitely a win-win. If you have existing games, I highly recommend working them into new Kickstarters. The $75 tier was a six pack of the game for retailers. Only three backers chose this level, and one of them might not actually be a retailer. I’m not sure this reward tier is worth including, but I like including at least a nod to friendly local game stores. What’s not included above? I was planning on having early-bird specials, but I was talked out of it. I’m glad I was. Early bird tiers will be taken by the first people who hear about the campaign, which tend to be friends and family who would have pledged anyway. And it can make people who discover the campaign later feel cheated. Make all of your reward tiers a good deal, not just the first few. The biggest omission is something special for ~$100. This is something I did for Corporate America (you could name a business or include a caricature of yourself as a protester), but I wanted to avoid non-game rewards for Shadow Throne. That was a mistake. Why? First, many people WANT to give you extra money. Your family and friends will look for an expensive reward tier so they can show you their special support. While you can pledge any amount for any reward tier, people will tend to pledge what you ask of them. But you should offer your special supporters something special! 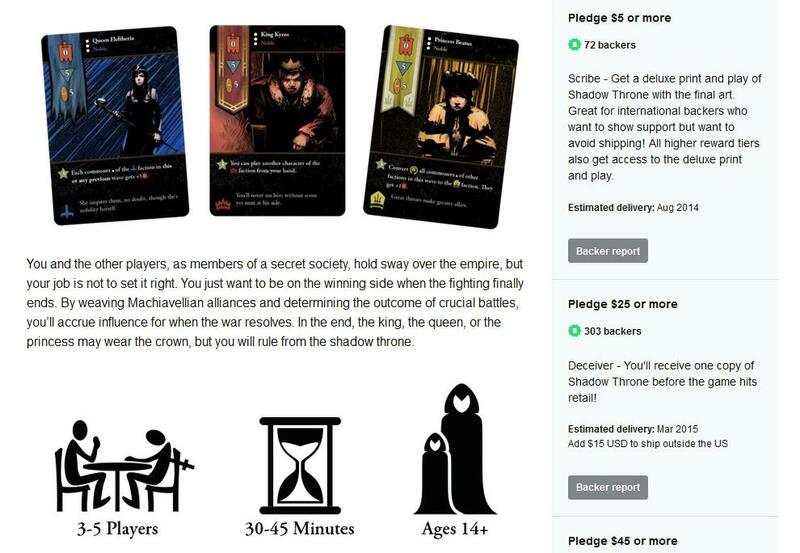 Kickstarter campaigns aren’t just a preorder system, they are an exciting event in themselves. Offering something special not only thanks your most generous supporters, it gives them something unique to remember the campaign with. I think this omission was the second biggest mistake with the campaign. Before I wrap up today, I also want to discuss international shipping a bit. I have to admit, dealing with logistics and distribution is not my favorite thing in the world, and I think that showed in the Kickstarter. International shipping in particular is challenging–it’s very difficult to tell how much it will cost to ship to various locations, and unless you want to do something complicated, like having different reward tiers for different locations or asking backers to adjust their pledges based on their location, you just get one price for international shipping. That means some people (like Canadians) will be overcharged, and others (Australians) will be undercharged. It’s a really frustrating situation, and I hope to get a better grasp of it by the time the next Kickstarter rolls around. Another issue with international shipping I discovered this time is that Europeans have to pay customs when you ship from the US, which can be very expensive. If you ship from within the EU, you can pay customs instead (at a discounted, bulk rate, from what I understand), but you need to find someone to receive your games in the EU and then ship them to backers, a pretty unthrilling job. Still, there are a number of potential backers that would have made the plunge if I’d figured this out, but instead I kept them in suspense for the whole campaign. Next time, I’d like to be able to give them a straight answer, preferably yes, right from the get go. For those keeping score, not figuring this out during the campaign was the third biggest mistake of the Kickstarter. Wow, that was a lot longer than I planned! For those wanting the clif notes version: everything was great, except the movie was amateurish, I didn’t include a fancy $100 reward tier, and I didn’t figure out international shipping better. But we’ve already gotten the worst mistakes out of the way, so the rest of these Kickstarter retrospectives will be sunshine and lollypops!